A young African-American man visits his Caucasian girlfriend's mysterious family estate. What a marvelous young African-American actor related horror flick with witty script. Jordan Peele's got strong, unique way of directing and creating plot. A bit predictable but entertaining. A fresh way of thinking though he does not forget to give his homages for his idols. An excellent first outing for Peele as director. Suspense done right, and an overall message that isn't too heavy-handed. It was tonally great, jumping between comedic bits and scary bits effortlessly. A relatively formulaic, but surprisingly unpredictable horror/comedy, who's greatest achievement is it's capacity to leave you uncertain if you should be laughing or screaming. Remove the scene where the friend talks to the officers and the flashbacks, as both interrupt the emotional flow of the third act. 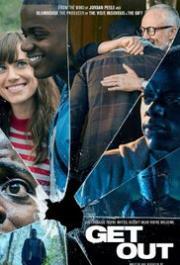 Otherwise this is a perfectly fine horror film bolstered by its racial satire as well as a streak of dark humor. The scene where Chris meets the partygoers made me laugh for several minutes straight. How this film ever got nominated and won at the oscars is purely political in my view. As a film it very unoriginal with basically the exact same plot and twist as seen in SK. So for me it was basically just old in new packing. However this is not a bad movie but not worth the watch if you’ve seen SK.